I'm sitting on a plane on the runway at LaGuardia, a victim of the warm weather you've been having for the last few days while I've been in drizzly, chilly New York. (Chicgao is 61� right now, but the temperature drops 30� over 150 miles and that steep difference is causing extreme weather all over Illinois.) We've been on the plane for two hours so far and we won't have an update about whether or not we'll head for Chicago tonight for another hour. But at least I'm better off than the guy sitting behind me. He's been talking on a cell phone to a friend of his his sister, psyching himself up for a conversation with his girlfriend(?) where he's anticipating her blaming him for being late on purpose, and then getting mad because she'll have to pick up the rental car they need to get to his sister's wedding tomorrow. Which he can't pick up because he lost his driver's license in Mexico. (Lost, or lost?) He just said, "I might as well just get up and announce to everyone on the plane that this is my fault, because that's what Shirley*'s going to say." We taxied back to the gate so that people who wanted to get off the plane could do so. Most of us decided to stick it out -- the weather can't be bad forever, can it? Meanwhile, the guy behind kept up a steady cycle of calls to his sister, American Airlines (to check on the status of our and Shirley's flight), and phone and text messages to Shirley. His calls to Shirley started out very cautious and conciliatory, but eventually he got a little agitated and he left a message that started out, "well, I guess your battery must be dead because I can't imagine why you'd have it off...". And then his next call to American revealed that her plane was still in the air, so he immediately called her back to apologize to her voice mail. The unkindest cut came when he tried to call the hotel they're staying in tonight in Chicago to authorize Shirley to check in without him. First he navigated a series of national reservation numbers to the hotel itself to someone who could help him (I heard the start of his explanation over and over as he started to explain the problem to some new hotel employee. "Well, Chad, I'll be arriving very late this evening...") only to have his cell phone cut off after the third re-explanation. When he finally reached the appropriate employee they wanted him to fax over some sort of authorization. "Ma'am, I can't fax you anything - I'm stuck on a plane." And then, just as the captain announced that we were leaving the gate to actually head for Chicago (three hours late), Shirley called. The conversation seemed to go as Guy Behind had feared it would. "No, don't do that. Don't do that. Don't do that. Either wait for me or pick up the rental car. There is no third option. ... I don't have a driver's license. I do not have a driver's license. There is no third option. It's very easy to get to the hotel and my sister can direct you. No, she's up. I've been talking to her and she's ready to help." I guess Shannon hung up, because then he called his sister to ask her to call Shirley. We were poised on the runway at this point and the flight attendants were announcing that we needed to have all electronic equipment off while he was talking to his sister. "Please call Shirley, she doesn't want to bother you because you're getting married tomorrow..." "Excuse me sir, that needs to be off." "... so please just call her..." "Sir, that needs to be off." "Bye. ... Do you think it was necessary to strike me?" "(inaudible)" "Because that was kind of bizarre." "(inaudible)" "Yes, you are sorry." And then the plane took off. You know, I don't know if this story is interesting to anyone else, but for the five hours I was stuck on the plane it was a mini-soap opera that was pretty much the only thing (other than Mario vs. Donkey Kong) that was keeping me from going crazy. Anyway, as soon as we landed Guy Behind was on the phone again. And Shirley had screwed him! She had taken a cab down to the hotel, who hadn't let her check in (despite Guy Behind's earlier phone calls). I haven't really mentioned how calm Guy Behind was through all of this -- he was agitated, but wasn't going to blow his cool. 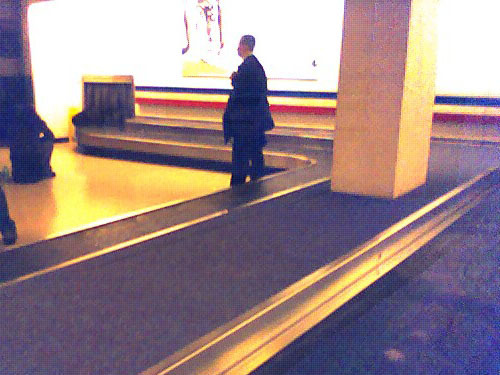 And when I saw him at the baggage claim I was surprised to see that he was wearing a tie. Did he wear it the whole 5 hours? Crazy cool, Guy Behind. And sadly, that's as much as I know of the story. Guy Behind took off from the baggage claim and went back upstairs as I was headed to the taxi stand. Good luck, Guy Behind. Have fun at your sister's wedding.